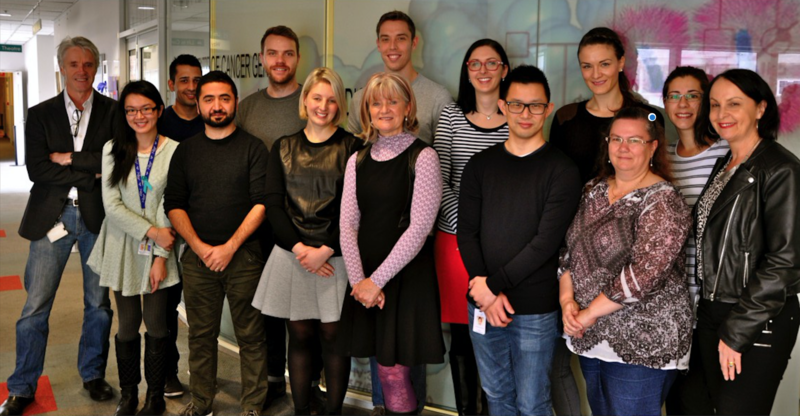 The Bowtell laboratory has a major focus on the genomic characterisation of ovarian cancer, seeking to understand the biology of treatment response and resistance, and to translate these findings into new treatment approaches. Many women diagnosed with high-grade serous ovarian cancer (HGSC) will initially respond to primary treatment, but upon recurrence show acquired resistance to chemotherapy. We recently performed whole genome sequencing on relapse samples from acquired resistant HGSC patients, and identified four molecular events associated with acquired chemoresistance. Using functional genomics, we are currently investigating treatment strategies to reverse chemoresistance. Utilising our access to patient samples through the Australian Ovarian Cancer Study (AOCS) and next-generation sequencing approaches, we are investigating possible biomarkers to guide drug selection in recurrent HGSC, and examining recurrent and metastatic end-stage samples to identify additional mechanisms of acquired chemoresistance. HGSC exhibits intratumoural heterogeneity, providing the diversity required for Darwinian evolution to occur, particularly under the selective pressure of chemotherapy. The heterogeneous populations of cancer cells are thought to interact to promote or inhibit subclonal fitness and survival. Using whole-genome sequencing of recurrent HGSC samples, we are investigating the clonal composition and acquisition of mutations leading to chemoresistance over time. Additionally, we are sequencing multiple metastatic sites to examine the patterns of metastatic spread in recurrent disease. We are also investigating methodologies to interrogate clonal interactions within tumours. Although a majority of women with HGSC demonstrate intrinsic chemotherapy resistance or develop resistant disease, we have identified a subgroup of patients that are highly responsive to chemotherapy, and some become long-term survivors. This spectrum of drug responses suggests fundamental differences in tumour biology that are not yet understood. As part of a large international consortium, this project will investigate at a molecular level why a subset of HGSC patients have an outstanding response to chemotherapy. Tumour samples collected from exceptional responders will be genetically and immunologically profiled to identify changes associated with enhanced sensitivity to chemotherapy and long-term survival. We believe that understanding how these women beat the odds may provide insights into improving outcomes of patients with HGSC that have a more typical disease trajectory. A significant number of women with HGSC are intrinsically refractory to standard platinum-based treatment. We have previously shown that amplification of the cyclin E1 gene (CCNE1) in HGSC is associated with primary chemoresistance and poor clinical outcome. We have demonstrated that CCNE1-amplified tumour cells are sensitive to inhibition of CCNE1/CDK2 activity using gene knockdown and small molecule inhibitors. Our current focus is to further advance novel therapeutic approaches to targeting CCNE1 amplification, through the development and characterisation of patient-derived xenografts and genetically engineered in vivo models of CCNE1-amplified HGSC. We also aim to identify and characterise additional events that enhance cyclin E1-mediated transformation using large-scale functional and genomic studies. Results generated from this project have significant potential for clinical translation. Immunotherapy has become a new treatment strategy that can result in dramatic and durable responses in a subset of cancer patients. Understanding the immune landscape, and correlating this with genomic profile, has emerged as a key factor. In a large collaborative project, HGSC samples will undergo detailed immune and genomic profiling in order to determine biomarkers of response and resistance to immune checkpoint inhibitors. In addition, involvement in translational studies associated with clinical trials will enable further understanding into potential therapeutic combinations involving novel immunotherapies and targeted agents. We have previously identified four molecular subtypes of HGSC using microarray gene expression profiling – C1 (mesenchymal), C2 (immunoreactive), C4 (differentiated) and C5 (proliferative) – which correlate with distinct patient outcome and biological features. To allow for higher sample throughput in a more cost-effective manner, we recently determined a minimal gene set signature for accurate classification of fresh and archival fixed HGSC samples using a relatively novel gene expression platform, NanoString. Our aims are to associate molecular subtype with clinical parameters, other germline and somatic molecular events, immune responses and epidemiological risk factors. To this end, we are participating in an international collaborative effort to classify over 4500 HGSC cases. The Australian Ovarian Cancer Study (AOCS) is a collaborative research program between clinicians, scientists, patients and advocacy groups aimed at improving the prevention, diagnosis and treatment of ovarian cancer. Initiated in 2001 by researchers at Peter Mac, the University of Melbourne, Queensland Institute of Medical Research and Westmead Institute for Medical Research, the first goal of the study was to create a uniquely powerful resource for ovarian cancer research, comprising biospecimens, clinical outcome and epidemiological data. A total of 2456 women from all Australian states have consented to take part in the study. The AOCS Biobank provides researchers access to DNA, RNA, plasma, serum, fresh frozen tissue, formalin-fixed paraffin-embedded (FFPE) blocks and tissue microarrays (TMAs), as well as matched clinical and epidemiological data. To date we have approved approximately 104 national and international projects. Find out more about the Australian Ovarian Cancer Study. In 2012 Peter Mac established the CASCADE program to enable the collection of metastatic tumour tissue and clinical data to investigate mechanisms of resistance, metastasis and cancer evolution using genomic and biological tools. The aspect of malignant disease that most directly contributes to patient morbidity and mortality is the development of treatment-resistant, metastatic disease that has spread from its originating site to other areas of the body. However, research is generally lacking into the properties of metastatic tumours and late-stage disease. We believe that to better understand the process of metastasis, as well as understanding why some tumours stop responding to treatment, we need to be able to collect patient tumour samples at death. CASCADE is a study involving rapid autopsy in cancer patients, one of only a handful of such resources globally. The CASCADE study opened at Peter Mac, with an initial focus on breast, ovarian, prostate and lung cancer and melanoma. The ovarian cancer arm of CASCADE is supported by the Australian Ovarian Cancer Study (AOCS) and involves senior pathologists, palliative care specialists, medical oncologists, familial cancer clinicians and scientists with extensive experience in biobanking and cancer cohort studies. Find out more about CASCADE. Patch AM, Christie EL, Etemadmoghadam D, Garsed DW, …, Bowtell DD (2015) Whole-genome characterization of chemoresistant ovarian cancer. Nature. 521(7553):489-94. Bowtell D, Böhm S, Ahmed A, Aspuria J-P, et al. (2015).Rethinking ovarian cancer ii: reducing mortality from high-grade serous ovarian cancer. Nature Reviews Cancer. 15(11):668-79. Etemadmoghadam D, Weir BA, Au-Yeung G, Alsop K, Mitchell G, George J, Davis S, D'Andrea AD, Simpson K, Hahn WC, Bowtell DD (2013). Synthetic lethality between CCNE1 amplification and loss of BRCA1. Proc Natl Acad Sci USA. 110(48):19489-94. Etemadmoghadam D, Au-Yeung G, Wall M, Mitchell C, Kansara M, Loehrer E, Batzios C, George J, Ftouni S, Weir BA, Carter S, Gresshoff I, Mileshkin L, Rischin D, Hahn WC, Waring PM, Getz G, Cullinane C, Campbell LJ, Bowtell DD (2013). Resistance to CDK2 inhibitors is associated with selection of polyploid cells in CCNE1-amplified ovarian cancer. Clin Cancer Res.19(21):5960-71. Alsop K, Fereday S, Meldrum C, DeFazio A, Emmanuel C, George J, Dobrovic A, Birrer MJ, Webb PM, Stewart C, Friedlander M, Fox S, Bowtell D, Mitchell G (2012). BRCA mutation frequency and patterns of treatment response in BRCA mutation-positive women with ovarian cancer: a report from the Australian Ovarian Cancer Study Group. J Clin Oncol. 30(21):2654-63. Cancer Genome Atlas Research Network (2011). Integrated genomic analyses of ovarian carcinoma. Nature. 474(7353):609-15. Tothill RW, Tinker AV, George J, Brown R, Fox SB, Lade S, Johnson DS, Trivett MK, Etemadmoghadam D, Locandro B, Traficante N, Fereday S, Hung JA, Chiew YE, Haviv I, Gertig D, DeFazio A, Bowtell DD (2008). Novel molecular subtypes of serous and endometrioid ovarian cancer linked to clinical outcome. Clin Cancer Res.14(16):5198-208.